Pet obesity is becoming an epidemic in the United states. 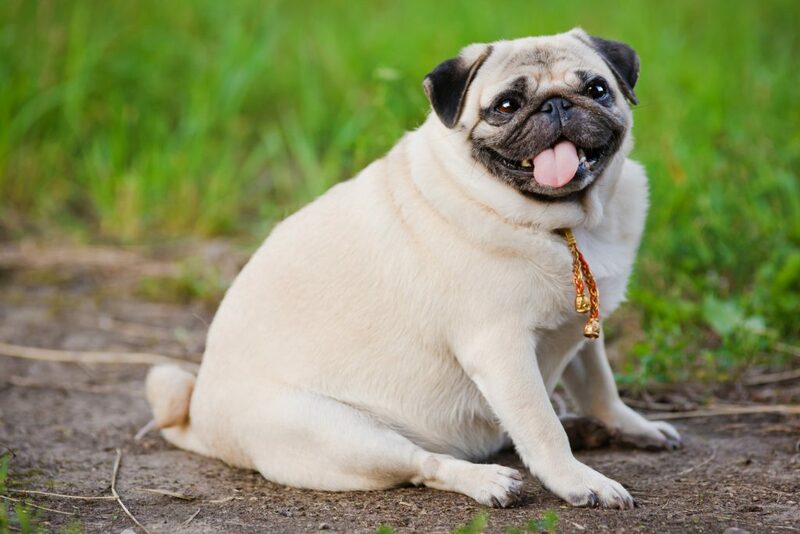 It is estimated that over half of all household dogs are overweight. At Animal Care Center that percentage is higher! Obesity can lead to many health problems including heart disease and diabetes. Another condition commonly seen is early onset of debilitating osteoarthritis. We often see patients who live in constant pain from early-onset arthritis due to obesity! The average person’s perception of a healthy weight in dogs is very skewed. Most of my clients are very surprised when I suggest that their pet is a little overweight. Because dogs can vary so much in size body shape, veterinarians use a scoring system (of 1-9) to assess weight in our patients. An ideal “body condition score” is 4.5/9. One is too thin and 9 is morbidly obese. HOW TO SHED THE LBS. By burning calories (exercise) and reducing the amount of calories consumed, your dog can become a healthy weight in no time. Remember: food, treats and table scraps ALL factor into daily calorie intake! Feed designated meals!! Free-fed dogs almost ALWAYS run heavier than their 1 or 2 meal-per-day counterparts. Think about how much weight YOU’D put on if you had an unlimited buffet each day! Pick a food that contains a myriad of ingredients – INCLUDING complex carbohydrates! Complex carbs make your dog feel fuller, longer. Grains are OK. In fact, grain-free diets tend to be very calorie dense. Limit treats and table scraps to tiny pieces – or eliminate them all together. Healthier treat options include carrots, green beans, strips of sweet potato (not deep-fried sweet potato!!). Do NOT feed your dog grapes, raisins, onion or garlic!! The can be toxic to dogs!! Feed less! Guidelines on the food package are just guidelines!! If your dog eats two cups of dog food per day, and he is fat, then feed less!! If he still seems hungry, you can swap some of his dog food for (thawed) frozen veggies (avoid butter, onion, garlic!) on top. Another good high fiber/low calorie topping is canned pumpkin puree. One heaping spoonful (large dog) or leveled off spoon (small dog), will let them think they are getting something special. Be consistent!! Use a measuring cup and be sure everyone in the house is on board. Post what portion of dog food Fido is allowed to have at each meal so everyone remembers. Exercise!! This is the hardest part for some owners! A couple of walks per day are good exercise for Fluffy AND you! Show them love with love, not food! Remember table scraps (or recliner scraps) all count in daily calorie intake! Be sure to consult with your veterinarian. Certain medical conditions can lead to weight that is hard to shed. Your veterinarian may also be able to recommend other food options, or calculate out the amount of calories your pet should have each day.